We’d love your help. Let us know what’s wrong with this preview of Dead Men Do Come Back by Steven C. Levi. Does it have anything to do with the 250 pounds of gold that have just been extracted from the Alaska Gastineau Mine? And how were both the frozen body and the gold able to disappe Why would someone kill a miner, freeze his body solid on a glacier and then drop it alongside the Juneau wharf, the one place where United States Marshal Gordon Whitford would be sure to find it? Now there is another shipment of 250 pounds of gold bound for Seattle - along with the miner's frozen body that has been recovered - again - floating just south of Juneau. Will Marshal Whitford be able to solve the murder and the robbery before the next shipment of gold vanishes into thin air? To ask other readers questions about Dead Men Do Come Back, please sign up. Dead Men Do Come Back is the saga of United States Marshal Gordon Whitford in Juneau, Territory of Alaska in the summer of 1910. Whitford is called to the city dock where he finds a dead sourdough floating in the frigid water of the Gastineau Channel. The sourdough's daughter-in-law comes to Juneau to claim the body where she begins an affair with Whitford. What Whitford does not know is that the murder of the sourdough is a set up for a robbery of a gold mine. What the thieves Synopsis/blurb…..
What Whitford does not know is that the murder of the sourdough is a set up for a robbery of a gold mine. What the thieves do not know is that they are being set up by the manager of the mine. 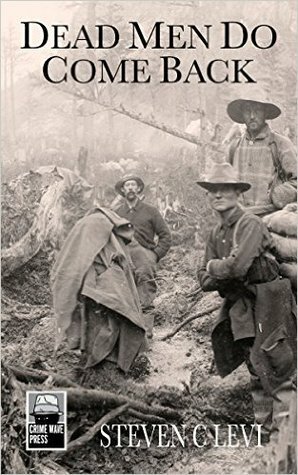 Another new author read here in Steven C. Levi and a trip to a cold and grim setting – Juneau, Alaska one hundred-odd years ago. Levi’s main man is Marshal Gordon Whitford. Whitford as an officer of the law is isolated in this cut off community. He has one bumbling assistant that he tries to send on spurious errands to keep out of the way and his main function seems to be to do the bidding of the local gold mine and owner, without which Juneau would have no reason for existence. A cross to bear for Whitford is the constant digs from the local newspaper which on an almost weekly basis, mock his refusal to crack down on the drinking and whoring that goes on in a supposedly dry mining town. What’s one man supposed to do? Our corpse in the dock comes with some interesting baggage in the form of the attractive and obliging Harriet Swanscombe, purportedly Chilly’s daughter-in-law. Whitford gets somewhat pleasantly distracted from the task at hand - investigating the murder, while entertaining our intriguing newcomer. Having sent Chilly’s corpse south for burial, Whitford is perturbed when the corpse reappears some days later back in the waters of Juneau. Somewhat disturbingly it reappears for a third time, as Whitford’s enquiries with some help from the South, take a turn in the direction of an insurance swindle and a maybe yes, maybe no actual robbery of gold. Interesting mystery with a great resolution, though I did get a bit confused when trying to comprehend what was happening in relation to the scam being perpetrated…….missing gold, was it or wasn't it ?, insurance dockets, reimbursement, no-one losing out (WTF??) etc etc. I’m not totally dim-witted and followed it up to a point but then totally lost the thread. Sad to say it kind of compromised my enjoyment of the book and at the time I wasn’t especially minded to re-read passages slowly and for a third time to try and have the fog lifted from my eyes. Possibly the explanation was logical and my senses were befuddled, the cold Alaskan setting causing my brain to temporarily undergo hibernation! Great main character in Whitford and a few of the supporting cast, especially in the form of garlic-munching Billy the Horse. Intriguing setting and with Levi’s background as an Alaskan historian, one I have to assume accurately portrayed. Not a place I’d care to time travel to myself. Overall solid and enjoyable, if a bit of a head-scratcher. If I’m totally honest I’m not a massive fan of YE OLDE HISTORICAL MYSTERY, but the author has gone some way towards moderating that particular prejudice of mine. I can’t find too much info on Mr Levi online, but there is a bit about him at The Alaska Writers Directory here. Review copy received from the publisher – Crime Wave Press. Steven Levi has recently had a second novel published - The Matter of the Vanishing Greyhound: Golden Gate Bridge Disappearing Greyhound Bus Caper, about which he says "I like to write impossible crimes, where the detective has to solve HOW the crime was committed as well as catch the bad boys and girls." The setting is present day San Francisco. This is definitely a thrilling mystery that I couldn't completely figure out. I really liked the Marshal and getting to know him and the way he sees things. I thought I had it all figured out but was nowhere close until the end to knowing who all was involved. There's a lot of moving parts to who killed the miner, why, and how everything happened. This is not a book ou fly through because you will miss details. The ending didn't quite satisfy me and left me wondering what was going to happen aft This is definitely a thrilling mystery that I couldn't completely figure out. I really liked the Marshal and getting to know him and the way he sees things. I thought I had it all figured out but was nowhere close until the end to knowing who all was involved. There's a lot of moving parts to who killed the miner, why, and how everything happened. This is not a book ou fly through because you will miss details. The ending didn't quite satisfy me and left me wondering what was going to happen afterwards. I was shocked when it was revealed who was involved because I didn't see it coming. If you love a good mystery and this time setting then I think you will like it.